Bougainville Women’s News: USA and Japan Support Bougainville’s Leitana Nehan Women’s Development Agency…. On January 21, 2015, U.S. 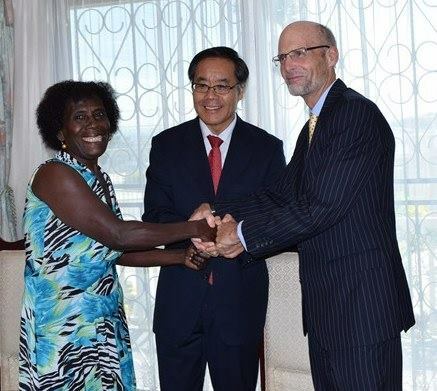 Ambassador Walter North attended a signing ceremony to celebrate the Japanese government’s awarding of a grant worth USD $81,252 (approximately PGK202,000) to build a new Human Resource Center for Bougainville-based NGO Leitana Nehan Women’s Development Agency. Awarded through the Japanese government’s Grant Assistance for Grassroots Human Security Projects (GGP), the grant contract was si…gned by Japanese Ambassador, H.E. Mr. Morio Matsumoto, and by Mrs. Helena Hakena from the Laitana Nehan Women’s Development Center. Since its office was burned down in 2010, Leitana Women has been doing amazing work out of temporary quarters, and has had to improvise to find space to hold counseling and workshops funded by the United States and other donors. The new center will provide critically needed office and training space for the organization. The U.S. Embassy in Port Moresby and the U.S. Agency for International Development (USAID) have supported work by Leitana Nehan Women’s Development Agency to carry out training workshops and activities on gender and human rights awareness, peace building engagements, and good governance capacity.